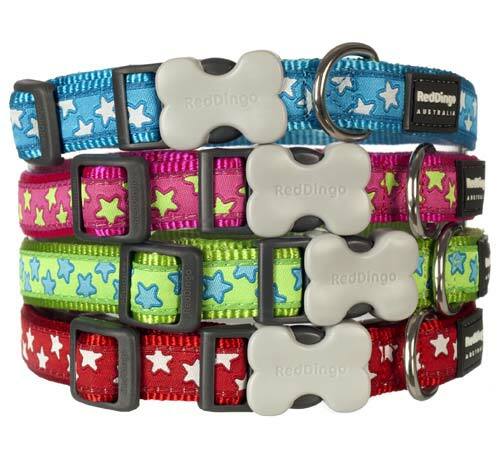 If your dog is a star, why not buy them one of these bright nylon dog collars with dazzling stars design. Totally out of this world. Premium nylon webbing and solid stainless steel D-rings make for a reliable yet stylish product. 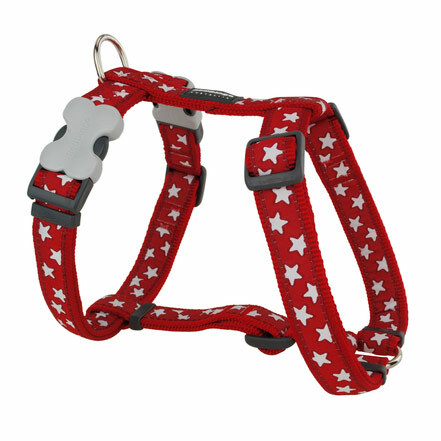 They are extremely hard wearing and feature the acetal plastic 'Bucklebone' which looks great and makes taking the collar on and off quick and easy. This star design comes in 4 colours and 4 sizes. 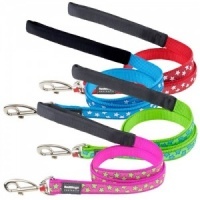 Each is adjustable so you get a perfect fit whether your dog is tiny or large. As they are adjustable they are also great for growing pups. 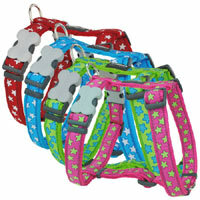 Matching leads and harnesses are also available. 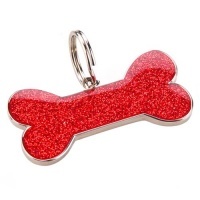 I bought this in red with white stars for my cairn terrier Ollie. It is nice quality with a strong clip, and looks cute with his dark fur. I also got one each for my son's two cairns. Turquoise stars on lime green for Tim, and lime green on hot pink for Stew (a girl!). The collars are pretty, and just that bit different, which I like. Thank you. I have been so impressed time and again with the quality and style of Red Dingo products and was so pleased to find a UK supplier who is helpful and trustworthy. 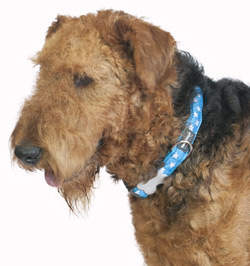 Really happy with the collar, easy to adjust, easy to put on but complete peace of mind that it is secure and sturdy. Gorgeous design; my little dog looks adorable in the pink/lime green star collar and bigger dog in the blue/lime green star collar. I would highly recommend D for Dog, great customer service, timely delivery and really easy to order. The collar is exactly what I wanted. It's nice to know you are supporting a small business too Keep up the good work D for Dog! Very pleased with this product. Looks lovely on. 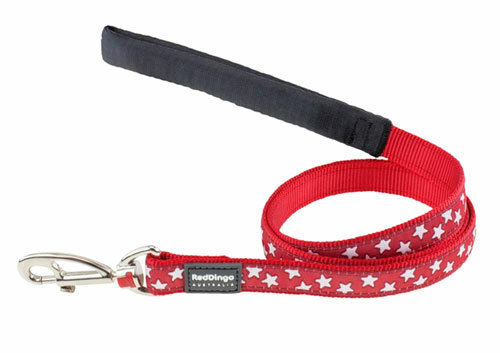 Lovely comfy collar, perfect for our wee Jack Russell Bertie. He loves it and wears it well. Very good, high quality collar - matches harness. 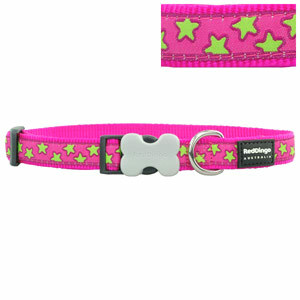 Pink with green stars, really pretty, nice clip great design.